R R 72 pt East Central R Alberta EVIEW 60 pt R 48 pt R 36 pt Your favourite source for news and entertainment in East R 30 pt Central Alberta, reaching 90 communities weekly Targeting East Central Alberta Thursday, December 20, 2018 Volume 107 No. 51 www.ECAreview.com R 24 pt R 18 pt In light of the recent Yellow Vest Movement in France opposing a similar Carbon Tax to that of Canada, residents of Hanna, Ab. decided to take action and join Grande Prairie in protest. People gathered in town because of the lack of action and support from both the Federal and Provincial government including the imposed carbon tax and to show solidarity in the Oil and Gas industry. The rally took place on Sun. Dec. 16 and the next one is scheduled for next Saturday at 11 a.m. Photo courtesy of Karen Lucier County of Stettler Council Botha Community Centre closing Terri Huxley ECA Review Council has decided to take on the leadership role of the Botha Community Centre as the group currently running the facility can no longer make ends meet. They conducted a trial run over the past year, utilizing the former administration building and church as a community facility, including the library and the small kitchen and meeting space. 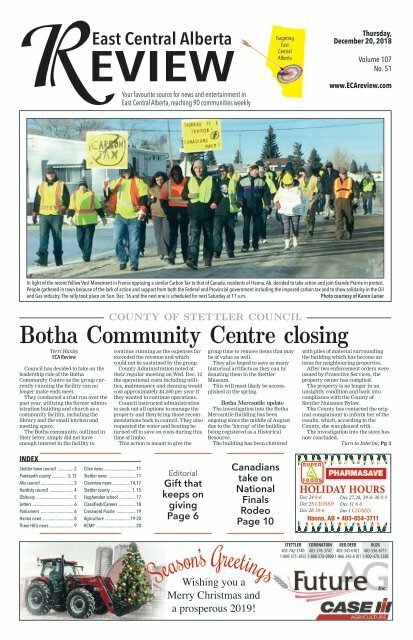 The Botha community, outlined in their letter, simply did not have enough interest in the facility to continue running as the expenses far exceeded the revenue and which could not be sustained by the group. County Administration noted at their regular meeting on Wed. Dec. 12 the operational costs including utilities, maintenance and cleaning would cost approximately $4,500 per year if they wanted to continue operations. Council instructed administration to seek out all options to manage the property and then bring those recommendations back to council. They also requested the water and heating be turned off to save on costs during this time of limbo.  This action is meant to give the group time to remove items that may be of value as well. They also hoped to save as many historical artifacts as they can by donating them to the Stettler Museum. This will most likely be accomplished in the spring. Botha Mercantile update The investigation into the Botha Mercantile Building has been ongoing since the middle of August due to the ‘hiccup’ of the building being registered as a Historical Resource. The building has been cluttered with piles of material surrounding the building which has become an issue for neighbouring properties. After two enforcement orders were issued by Protective Services, the property owner has complied. The property is no longer in an unsightly condition and back into compliance with the County of Stettler Nuisance Bylaw. The County has contacted the original complainant to inform her of the results, which, according to the County, she was pleased with. The investigation into the store has now concluded. Turn to Interim, Pg 3 INDEX Stettler town council .............. 2 Paintearth county ............. 3, 12 Alix council ............................. 3 Hardisty council ..................... 4 Obituary ................................. 5 Letters .................................... 6 Parliament ............................. 6 Hanna news ........................... 8 Three Hills news ...................... 9 Clive news ............................ 11 Stettler news ........................ 11 Clearview news ............... 14,17 Stettler county .................. 1, 15 Hughenden school ............... 17 Classifieds/Careers ............... 18 Crossword Puzzle ................. 19 Agriculture ...................... 19-20 RCMP ................................... 20 Editorial Gift that keeps on giving Page 6 Canadians take on National Finals Rodeo Page 10 HOLIDAY HOURS Dec 24 8-6 Dec 27,28, 29 & 30 8-9 Dec 25 CLOSED Dec 31 8-6 Dec 26 10-6 Jan 1 CLOSED Hanna, AB • 403-854-3711 STETTLER 403-742-3740 CORONATION 403-578-3747 RED DEER 403-343-6101 OLDS 403-556-6711 1-800-371-3055 1-888-578-0800 1-866-343-6101 1-800-470-2388 Season’s Greetings Wishing you a Merry Christmas and a prosperous 2019!